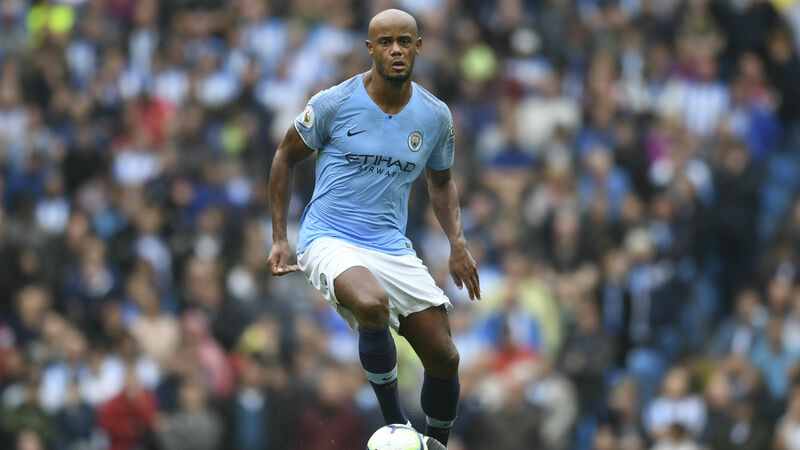 Vincent Kompany says he is using his experience of Premier League triumphs in 2011-12 and 2013-14 to help his Manchester City team-mates overcome Liverpool in this season's pulsating title race. Pep Guardiola's side are two points behind Liverpool at the summit but do have a game in hand, against Manchester United a week on Wednesday. While City won the title by a whopping 19 points last season, they required final-day victories to get their hands on the trophy in 2012 and 2014 ahead of United and Liverpool respectively. And given the tight nature of this season's battle with Jurgen Klopp's side, Kompany says he his sharing his experiences of City's first two Premier League wins and not last season's procession to glory. "That's kind of the experience I try to pass on to the other lads," Kompany told reporters. "Last season is not the one we should refer to really. It's the other two where we had to win every game and we had five games to play, six to play. "It was the same type of battle, between two teams, and what I say is that in those times you can actually trust your team to be better. "You can trust your team to be better than before because everybody prepares well, goes to bed at the right time, people eat right. It's the priority on everyone's mind and that should give comfort rather than nerves." Kompany made just his ninth Premier League start of the campaign in City's 3-1 win over Crystal Palace on Sunday. Raheem Sterling scored twice to take his league tally for the season to 17 and the City captain says the England forward has reached a level where match-winning displays are now expected. "Raheem is there at the right time," he said. "These are the moments we are expecting him to be bringing the team over the line. He's a great professional." City face Tottenham in the second leg of their Champions League quarter-final on Wednesday, before taking on Mauricio Pochettino's side again in the Premier League four days later.